Whip up an easy DIY dish towel pillow cover with fringe in no time. And sew or no sew...that's up to you. A little secret? Up until about a week ago, that Christmas pillow I made from a Target placemat back in December, was still on my bed. Yup. It was just too pretty to put away and I hadn't found anything else to replace it with. Sure, I had the white pillow that used sit there, but now that I had grown accustomed to a little bit of color in the space, I needed it. However, hard as I looked, nothing caught my eye. 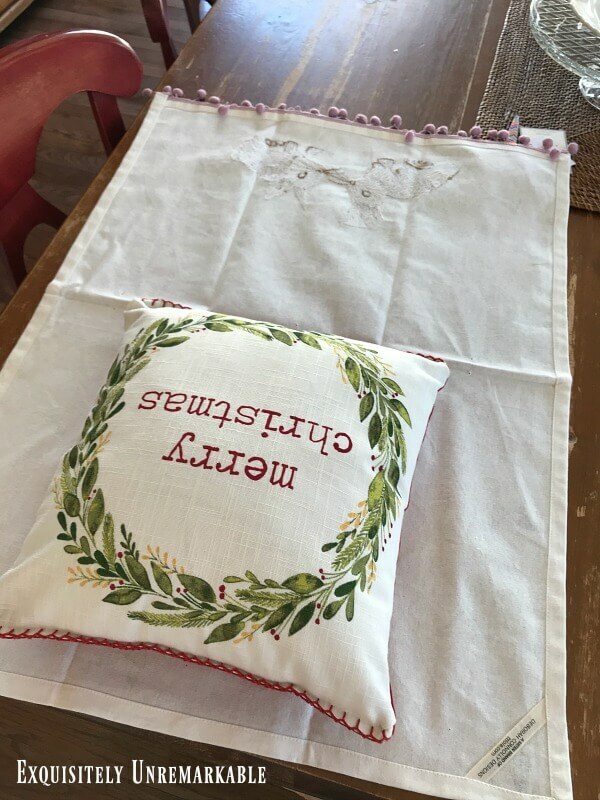 I had taken my pillow making skills up a notch, simply by choosing that holiday placemat with trim and I was on the hunt for something equally as impressive. 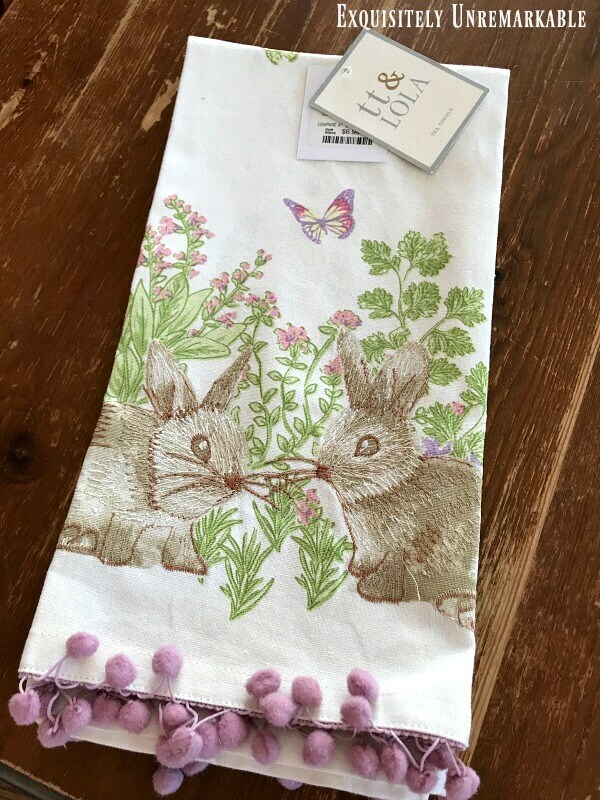 Luckily, I found this darling embroidered bunny kitchen towel at Home Goods. It was $6.99 for a pair and they both came embellished with the sweetest ball fringe. Done. This was an easy one, because I don't craft any other way. 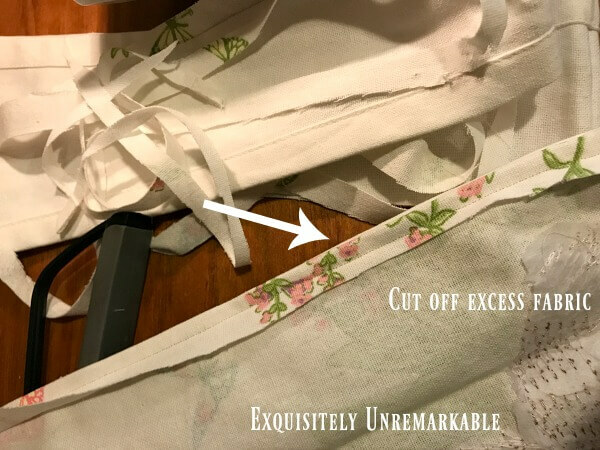 If you can't sew or don't want to, don't be deterred, you can use fusible web to make your own. 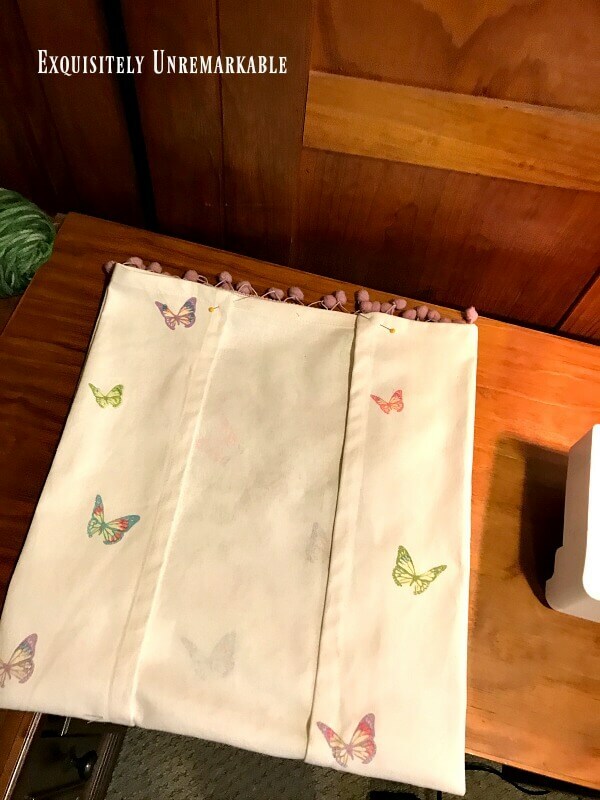 There are so many gorgeous dish towels out there today, it's not difficult to find one that suits you and they're so inexpensive, you can make one for each month of the year if you wish. 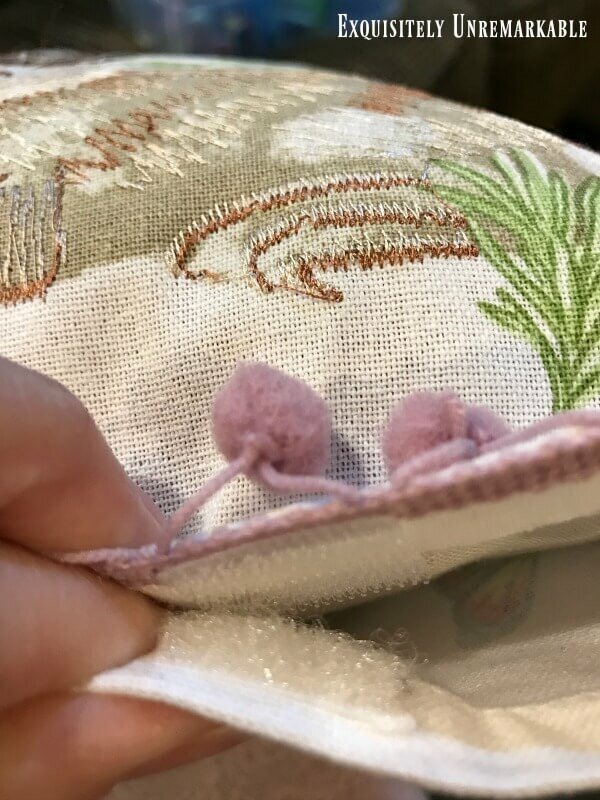 Best of all, since the ends are already finished, the need for a lot of sewing ~ or ironing ~ is reduced and oftentimes, they come with trim which gives the pillow cover a designer look. Step one, I started by measuring my Christmas placemat pillow against the towel to map out my plan and make sure I had enough fabric to make it work with minimal sewing. Step two, I folded my towel so that it would fit my pillow, leaving a little bit of extra fabric on the sides for seam allowance. Turns out I didn't need to trim the length at all. Step three, I pinned my towel, inside out, so it would stay put while I stitched the sides closed. Using my very well behaved sewing machine, I ran a stitch up each side with the foot right on the edge of the fabric. Now, if you're not into sewing, that's ok, instead of using a needle and thread you can close up the seams with iron on fusible web. I've recovered a chair this way and repaired my sofa. 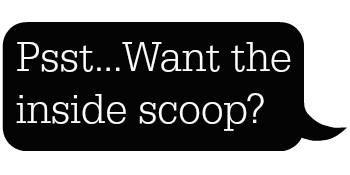 It's durable and super simple to use. 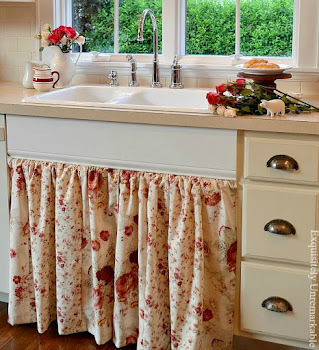 The only difference is you'd leave the dish towel with the right sides facing out, slip the fusible web in between the front and back edge and iron. If you noticed in the photo above, there's a lot of extra fabric on the sides that's not necessary. Once the seams were in place, I just cut it away with my super sharp fabric scissors. You can remove it before you sew if you prefer, but I like to leave it in place until I'm certain I won't need it. I'm not a proficient seamstress, I make mistakes all the time...so I like a little insurance. The final step in this process was close my pillow cover up. 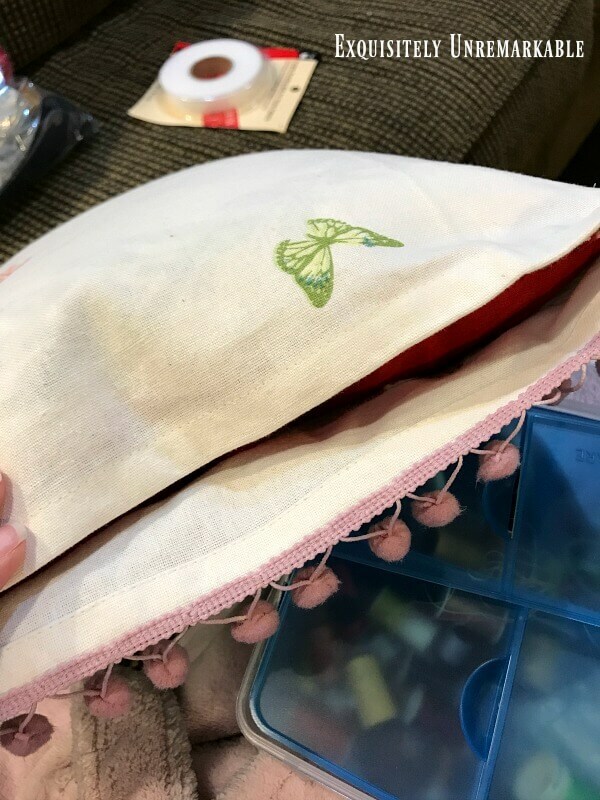 At first I thought about adding a zipper, but the opening would've ended up being very small and I didn't want to have to squish my pillow that much to make it work...especially since this cover was going to be temporary. The other thing I had to consider was that delicate ball fringe. It was the star of the show and I wanted it to be very visible. The easiest method to accomplish that was by closing the pillow up in a way that it would lay flat so I could pull it to the front and have the pillow sit on it when displayed. In the end, I settled on velcro tabs to make it work. It was super quick and since I had some in my craft cabinet it didn't cost me a dime. I never cut the length of the towel, so I had a bit of extra slack at the bottom which allowed the fringe to fold forward when the pillow was on the bed. I used just enough velcro to make sure the seam was taut and flat. And no sewing here...I used the sticky kind, like I did when I covered my cabinets. And...it worked like a charm. The pillow sat on the fringe as expected and brightened up the entire room. Trim really does make a difference. I'm sure this pillow would be almost as cute without it, but that one detail takes the look from crafty DIY to Did you get that at Pottery Barn? For less than ten bucks and in about ten minutes, I ended up with a brand new embroidered pillow cover with exquisite detailing for my master bedroom. It will take me all the way through spring and to be honest even summer....although I could turn it around and upside down and display the butterfly side come June or July. So that's actually two pillow covers for less than ten bucks and in about ten minutes. Very cute,Kim! I love your quick and clever pillow cover...and I LOVE bunnies!!!! Nice job- you are a better sewer than you know---that is SEW-er---like in sewing....not sewer---like in underground line to the main sewer. Thank you, Diana!! And your mind works like mine…every time I type that word, I see the underground line kind…not the needle and thread kind. Ha!! Seamstress is so much more elegant. Hi Kim, you make the prettiest pillows for each holiday. I love this bunny pillow cover you made. You make everything look so easy to make. Thanks for showing the process to make one. 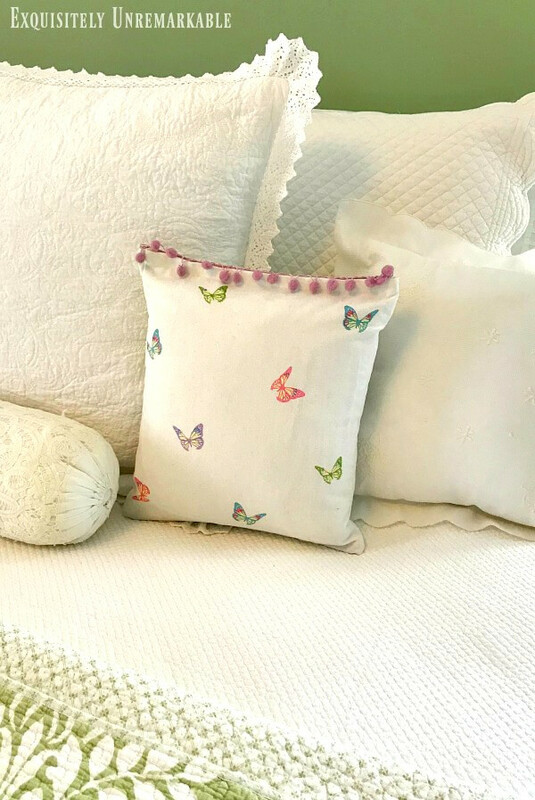 The pillow is just perfect for spring and easter! Julie, thank you so much. 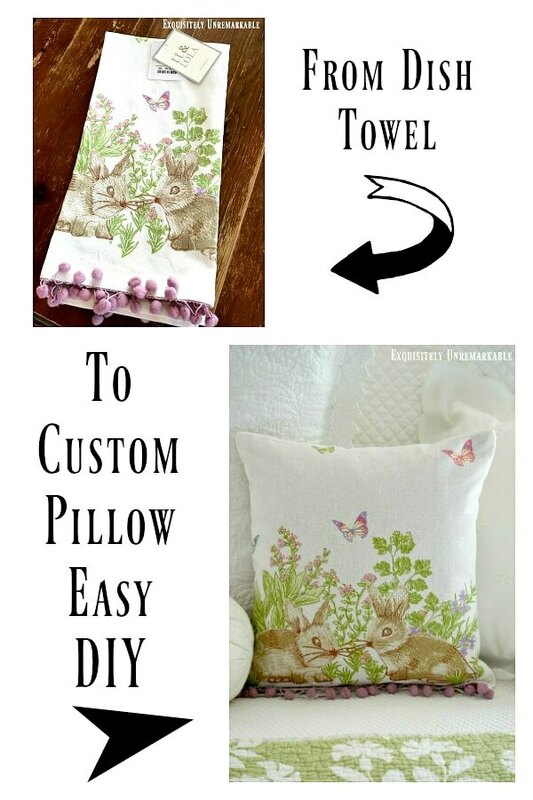 I just like easy crafts and using a dish towel is super simple way to get a fabulous looking pillow. Plus those bunnies were too sweet to pass up! Thanks Penny! There are so many cute towels out there for next to nothing. I LOVE BUNNIES!!! This is so cute and just such a great idea. Thank You! Thanks Carla! I love bunnies, too...and I had a couple growing up. It did not end well, but that's a story for another day! Kim, I love these pillows! Every time I see one of your beautiful sewing projects, I tell myself I need to hit Walmart and buy a lower grade one to see if I still have some sewing skills! 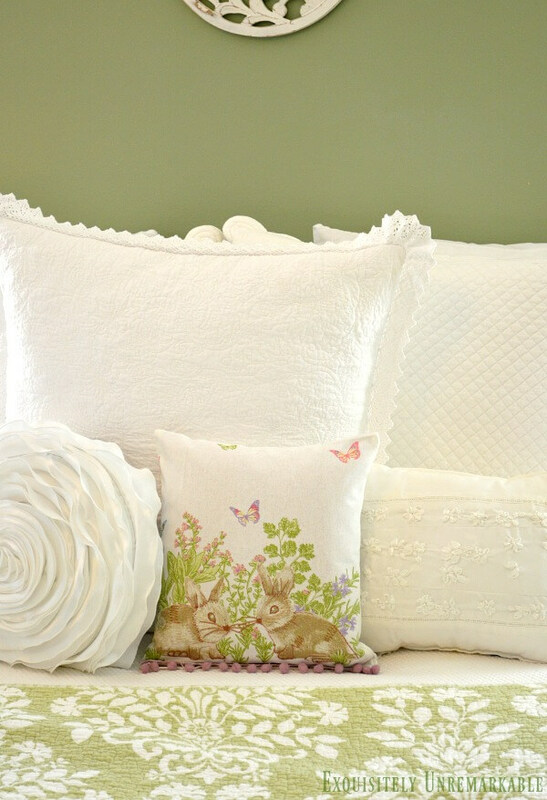 These pillows are so pretty and so full of spring...I love them! Love and hugs! I say go for it, Benita. It’s like driving a car, put your foot on the pedal and keep the wheel straight. It’ll come right back to you! That is adorable. Great job. How nice that the green seems to be a perfect match to the green in your quilt. I love that it is reversible. You are so smart - these pillows are adorable! I’m so glad, Judy!! The velcro was a quick trick and worked perfectly. I highly recommend it! Well look at you Miss Crafty!!!! This pillow is adorable. What a great idea. Love the sweet bunnies. Thanks Kris! It was so sweet, I just couldn’t pass it up when I saw it. I love easy, Mary!! And yes, those pom poms really do take it to the next level and with no extra work at all. Fabulous! Well, I think all of us wish we had this pillow! Kim, it really is lovely and so are the rest of your linen pieces that surround it. $6.99 a pair? I've got to find a local Home Goods, even if they only make it as far as my kitchen. But you have made the instructions clear even for someone like me. I love the fringe. I love the color of the fringe! I'm so glad my instructions were clean, Dewena! I always worry that the directions will get lost in translation. And I agree, those bunnies are perfect just the way they are, but I do love them on my bed!! I hope you find a pretty pair of your own! been wanting to make my own pillow and you inspired me. Lovely pillow. So glad you found something useful today, Maria!! And thanks! Oooh! I can’t wait to see it!! Happy spring!! 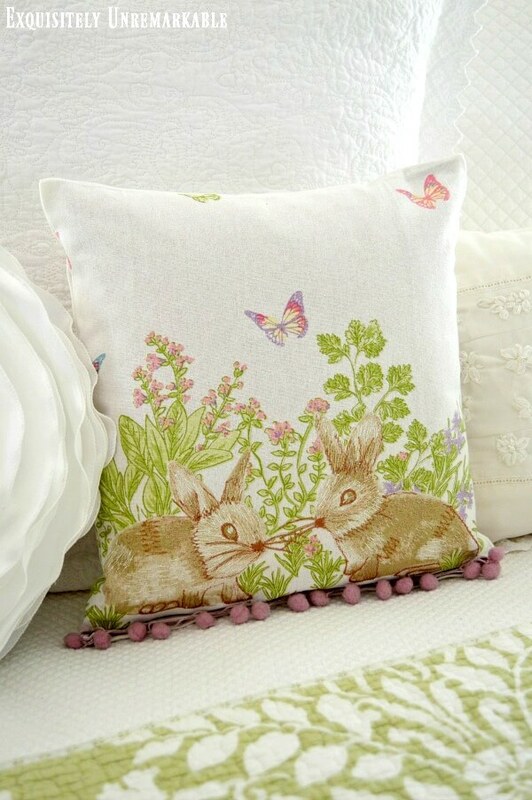 That pillow combines 2 of my favorite things....bunnies & pompoms:) It's adorable! I so wish I could sew!!! My mother did her best to teach me but it just didn't take!!! Seeing all these bunnies and spring stuff on everyone's blogs tells me I'd better crawl up into the attic and find my spring/Easter decorations!!! Cheri, I was smitten with those pom poms, too. I couldn’t resist! And honestly, you can get the same results with an iron on tape or fabric glue…but even just hanging in the kitchen, these bunnies would look adorable. Have fun decorating!! You are seriously adorable, my crafty friend!! Love that pillow, and it's perfect in your room. Wow, I miss Home Goods! Haven't been there in eons!! I think about your Home Goods almost every day Debbie, when I look at my kitchen table. I scored an awesome Lazy Susan there for less than $10. Vacation bargains are the best! And thanks for the sweet words about the pillow! So cute! Thanks for sharing. Pinning. It's adorable and it goes great with your bed cover. Love the trim! Thanks Linda! I really couldn't even buy the trim alone for that price! Thank so much, Natalia! It was a quick project, just the way I like them. Thanks Su! I'm itching for spring! Love your pillow. I will be back to check out your tutorial in more detail. I have a map tea towel from my holiday's that I would love to turn into a pillow. Thanks Claire! I was so simple, you could do this in no time. And a map would look great! Thanks so much, Marilyn! I couldn't resist the fringe and it was a great way to cheat myself to trim! 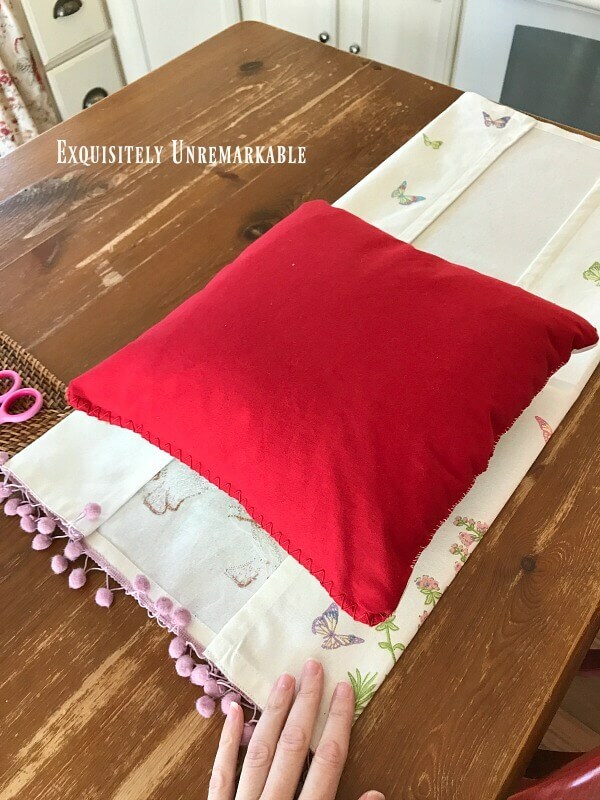 Thank you for sharing this lovely, easy craft pillow. I have just the towels to do this and was wondering what to do with them. You're great.